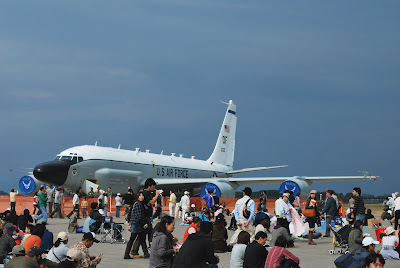 Last Sunday, Oct. 18 was the Misawa Air Fest 09 held in Misawa Air Base which was jam-packed by Japanese people who came from different places as far as Tokyo. 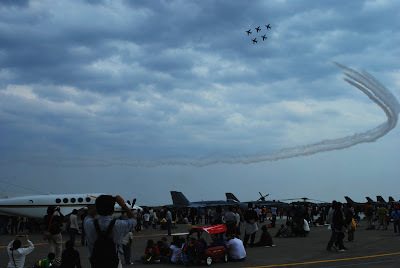 It was estimated that 250,000 people watched the air show. It took us 40 minutes to get to the base from our house off-base which normally takes 12 to 15 minutes only without traffic. 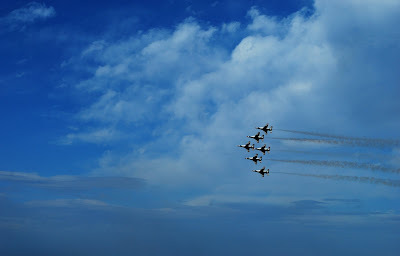 My husband was too hesitant to go to the air show because of the anticipated long hour traffic (he hates traffic). 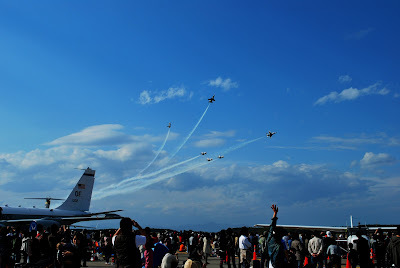 But since I wanted to go and I knew this is just one’s in a lifetime opportunity to see Thunderbirds perform in Misawa (since we missed them in Hawaii when they performed in 2007) so I won the battle, I was able to convince him hehehe. We left at 10am, I didn’t push my husband to wake up early lol, we ate breakfast before we left because I knew the traffic would be bad so we might as well eat first before we travel (so he won’t be mad too LOL). Finally, we arrived there at around 10:40am, for me it’s not that bad compared with the Japanese people waiting in line at the gate, a lot of people were walking wearing their high heels some were carrying ladders, chairs and humongous lens. It was too late to see the parachute demonstration, at least we got to see the Blue Impulse before the Thunderbirds' performance. During Blue Impulse demonstration it was a bit cloudy but when the Thunderbirds performed the sun really did cooperate with them. It was a bright and sunny! See my pictures and check the difference. 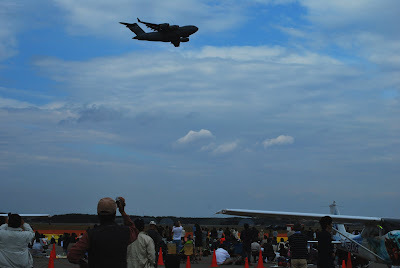 I noticed that Japanese were eager to see the airshow as well as to buy the American Foods . I saw a long line of Japanese trying to buy Anthony’s Pizza and buy cakes from different organizations on base. Being a lover of anything that flies, this is the kind of show I definitely won't miss. The sound from roaring engines must be incredible! 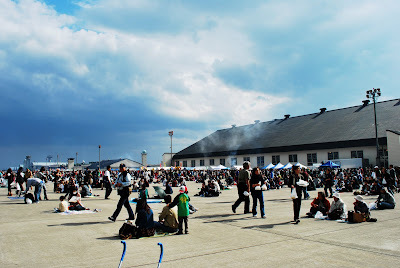 The first airshow I attended was in San Francisco and I was hooked since then. A college buddy of mine joined the Philippine Air Force and became a member of the Blue Diamond Team. He was flying in a formation during a July 4th parade when his jet plane (F-86) flamed out and crushed, killing him instantly. They used to call the planes used by the PAF then the "flying coffins." I hope they have better and more reliable planes now. 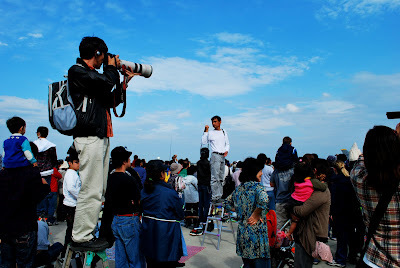 It is very funny that you included a picture of the guy with the HUGE lens... I have one of him too! My family was sitting close to him as well. 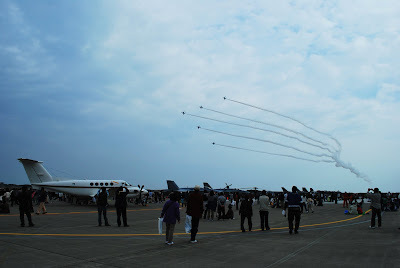 Nomadic- yes, you definitely should not miss this air show; have you watched any airshow before? 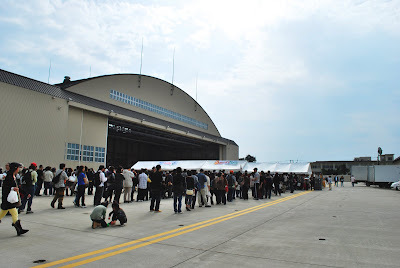 BertN- so tragic to hear that your friend died from the air show, I didn't know the PAF has an air show too, I thought they only have tora-tora hahaha. I remember watching parachute demonstrations from our street since we were close to Camp Crame and Camp Aguinaldo. And I remember there was a tragic accident too, the parachute didn't open, too bad. BB- Oh you had a good spot in the airshow then, we were at the other end, close to the US Air Force plane. Thanks for dropping by.